So, I started making my Thanksgiving cards, how about you???? Have you? It will be here soon, and Michael commissioned me to make some cards for his coworkers. JustRite Stampers has a perfect challenge this week, which is COLORS OF FALL, so I thought it was perfect time for me to play along. And here is the card I made for it. The shape was cut out using a brand new Samantha Walker Silhouette leaf shape, which I found in the Silhouette store today. I was happy, as I had this leaf card in my head to create. 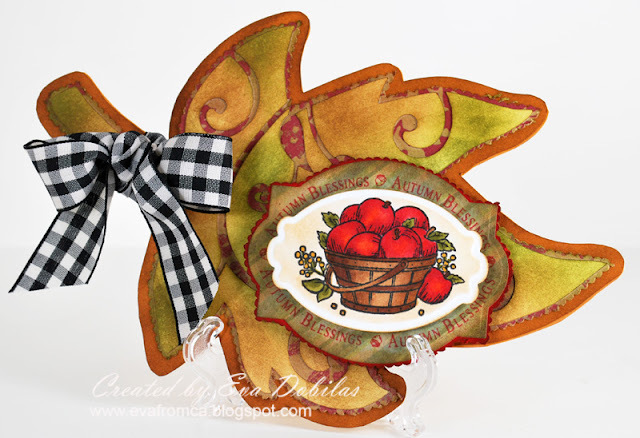 The JustRite Stampers stamps I used are called the Autumn Blessings Border and Centers. I also used Spellbinders on this card. Hope you like my little card. I am off to make another Grateful card and will be sharing it just in a few hours.